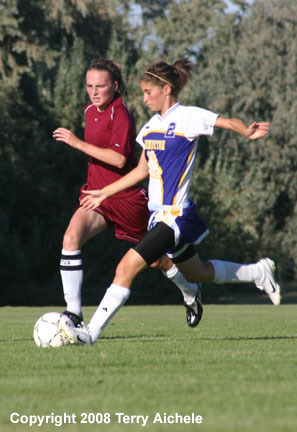 HERMISTON - McLoughlin High Pioneers of Milton-Freewater traveled to Hermiston on Monday to take on the Lady Bulldogs at Sandstone soccer field. The first half had both teams lacking a successful scoring drive. Mac-Hi did control the ball in the Hermiston zone for the majority of the half but couldn't score in part to the great defense by the Hermiston goalie. Hermiston did put some pressure on towards the end of the first half but couldn't get the ball into the net. Both teams slowly turned up the pressure in the second half. About 13 minutes into the second half Mac-Hi fired a header into Hermiston's goal to take a 1-0 lead. 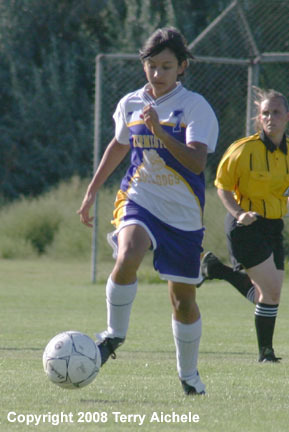 Hermiston began spending more time in the Pioneer's zone with a lot of pressure by (numbers two, three and four) along with others to score a goal. Finally about 28 minutes into the second half (number two) streaking up the middle and closely guarded by two Mac-Hi players kicked one in from about 15 metres out from the net. 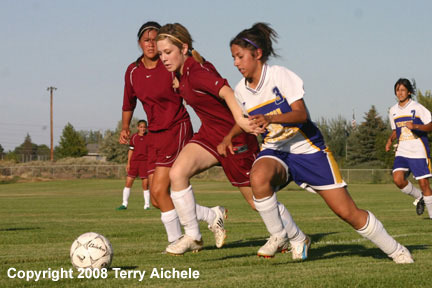 Hermiston continued to pressure the Pioneers during the rest of the second half but couldn't come up with the winner. 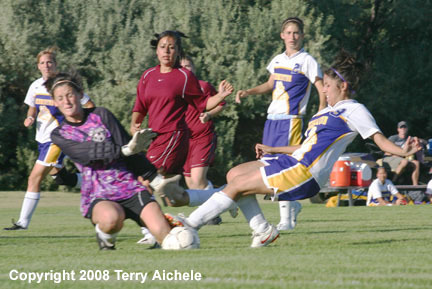 Still it was good outing with Hermiston coming from behind to tie it and a great job in goal by the Bulldog goalie. LEFT - Hermiston made a number of nice drives deep into Mac-Hi territory in the first half. 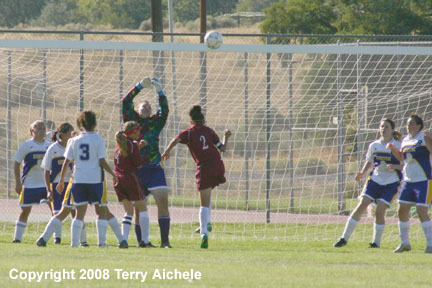 RIGHT - Hermiston's goalie was kept busy blocking, catching and deflecting a barrage of shots from the Pioneers throughout the match. LEFT - Another Hermiston player drives towards the Mac-Hi goal. 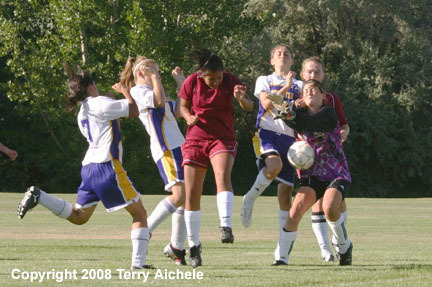 RIGHT - Hermiston players try to overwhelm the Mac-Hi defenders and goalie in the first half of the match. 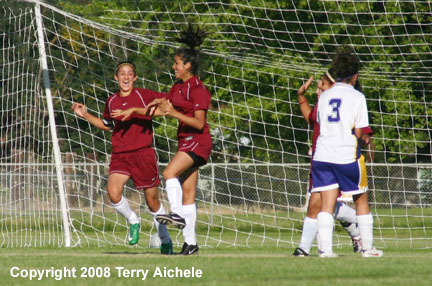 LEFT - Mac-Hi players celebrate their goal at about the 13 minute mark of the second half of the match. 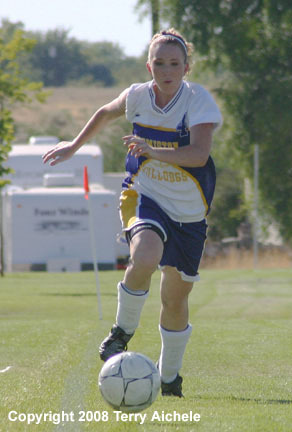 RIGHT - Hermiston player number two drives to the goal about 20 minutes into the second half. These two photos show Hermiston player number two kicking the goal that ties up the score at 1-1. 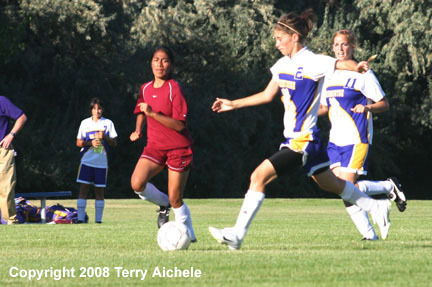 LEFT - In the closing minutes of the match Hermiston increased the pressure in an attempt to score the winning goal. Here a Bulldog gets tangled up with the Mac-Hi goalie but there is no goal. 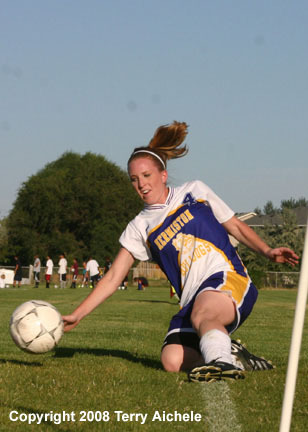 RIGHT - A Hermiston player slides along the sideline to keep the ball in play deep in the Mac-Hi corner. 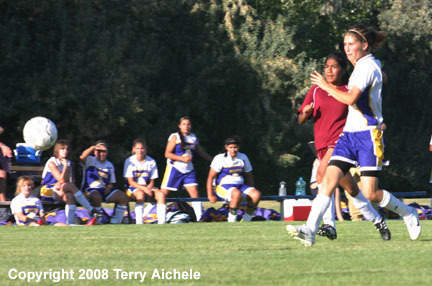 Hermiston puts on the pressure all the way to the final whistle.